Pie is iconic. Thanksgivings and fall picnics are not complete without that handcrafted piece of tradition. Honestly though, tradition is why I make it. I have never been a huge fan of fruit-filled pies. Load them with chocolate mousse and I’m all in, but fruit pies have never made a huge impression on me. Once a year was enough, until something changed my mind; namely bourbon. Duh, right? “Oh, so you don’t like your pie Miss Food Snob? Try it with some bourbon. Better? I thought so.” But this isn’t just “better”. Bourbon alongside blackberries is tremendous, it adds a rich element, lifting everything to the next level. This pie is best served at room temperature, which also makes it convenient for transporting to all those“bring a dessert”parties. Bake it the day before and you are sure to impress the pickiest of friends. Before we begin I need you to promise me something. Promise me you will not dump this gorgeous filling into a store-bought pie crust. Yes, it would be better to make the filling yourself and buy the crust rather than leaving everything to the store, but unless you cannot absolutely avoid it, I beg you, please make it yourself. 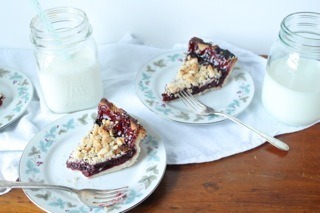 Pie crusts are not extremely time consuming and can be made days in advance and frozen so they are almost as convenient as store bought. Do you promise? Ok good, we can continue now. All crusts begin basically the same way. Butter, check! Shortening, check! Flour, check! Spray bottle filled with ice water, check! Yes, a spray bottle works best, I have done both methods; pouring the water in or lightly spritzing and I have to go with Alton Brown on this one, the spray bottle is the best tool for the job. In your handy dandy food processor pulse flour and salt. Slowly drop in pats of butter, pulsing until all the butter is added and in pea-sized pieces. Add shortening and pulse serval times until fully incorporated. 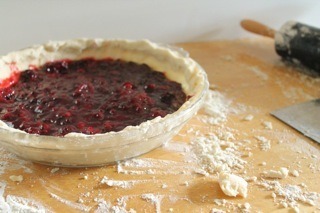 Transfer dough to another bowl and lightly spritz with water until the crust becomes a rough dough. When making pie crusts, if it looks perfect then you’ve added too much liquid. We want it to still be pretty dry but just able to hold together. Divide the dough into equal parts, cover in plastic-wrap. Refrigerate for 1 hour. The dough needs to firm up and rest; no skipping this step! While the dough is chilling prepare your filling. In a heavy saucepan combine; 1/4 cup bourbon, 1 1/4 cups sugar, 2 tablespoons lime juice, 1 teaspoon lime zest, 1 teaspoon ground ginger, and 3 cups frozen blackberries. Over medium-high heat bring to a boil, cook until the berries have softened, 5-10 minutes. In a small bowl, whisk 2 tablespoons cornstarch into 1 tablespoon water, this will create a slurry; slowly drizzle into filling. Boil for 5 minutes or until filling has fully thickened. Remove from heat and cool to room temperature. When dough has fully chilled roll out first portion and place in pie pan. Pour in filling. In a small bowl, combine the remaining portion of dough with 1/4 cup sugar using a fork to create a crumble. 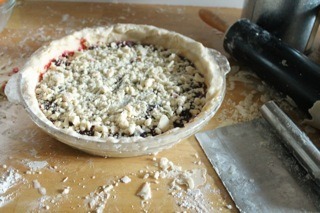 Cover the top of your pie with crumble and bake at 425 degrees for 30-40 minutes or until crust is golden brown. 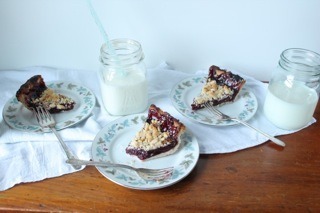 Allow pie to cool completely before serving. (It goes well with glasses of really cold milk, just saying.) Enjoy! In your handy dandy food processor, pulse flour and salt. Slowly drop in pats of butter, pulsing until all the butter is added and in pea-sized pieces. Add shortening and pulse serval times until fully incorporated. 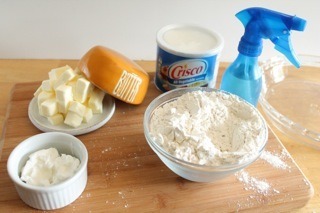 Transfer dough to another bowl and lightly spritz with water until the crust becomes a rough dough. (When making pie crusts, if it looks perfect then you’ve added too much liquid. We want it to still be pretty dry but just able to hold together.) Divide the dough into equal parts, cover in plastic-wrap. Refrigerate for 1 hour, the dough needs to firm up and rest; no skipping this step! When dough has fully chilled roll out first portion and place in pie pan. Pour in filling. In a small bowl, combine the remaining portion of dough with 1/4 cup sugar using a fork to create a crumble. Sprinkle over pie before baking. Bake pie at 425 degrees for 30-40 minutes or until golden brown. Enjoy! 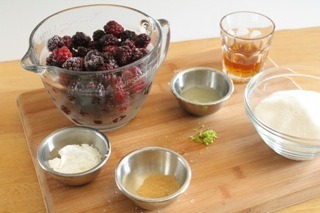 Combine bourbon, sugar, lime zest and juice, ginger, and blackberries in a heavy saucepan. Over medium-high heat bring to a boil, cook until the berries have softened, 5-10 minutes. In a small bowl, whisk 2 tablespoons cornstarch into 1 tablespoon water, this will create a slurry; slowly drizzle into filling. Boil for 5 minutes or until filling has fully thickened. Remove from heat and cool to room temperature before adding to crust.